I decided to call this design cleaves because it's a combination of a cowl and sleeves, and it covers my cleavage! It's perfect for cool spring nights when you need a little something but an entire sweater is too much. I get compliments on it wherever I go, and it's functional year-round here in San Francisco! 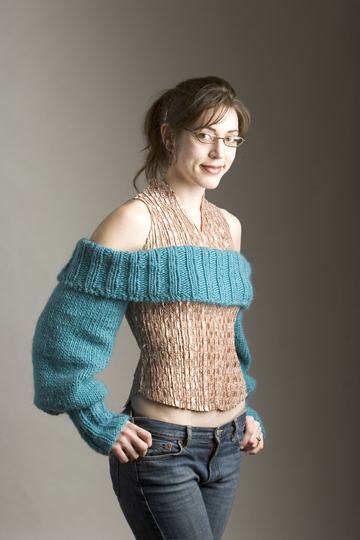 You start by making the sleeves, and then you put the sleeves on a circular needle joining them with a cable cast on. This creates the cowl so you can knit the rest of the garment in one piece. There are no seams to sew up at the end, and you can finish it in a weekend! Make a slip knot, and place it on the left needle. Knit into this stitch without removing it from the needle, and place the stitch just created on the left hand needle. [Knit BETWEEN the last 2 stitches on the left needle, then place the stitch just created on the left needle] until desired number of stitches is reached. Using dpns CO 24[24, 28, 28] sts. Place marker and join to begin working in the round, being careful not to twist. Round 1: [K2, p2] to end. This round forms 2x2 rib. Cont in 2x2 rib until work measures 7.5[8, 8, 8] inches from beg. Next Round: [K1, kf&b] around. 36[36, 42, 42] sts. Next Round: [K2, kf&b] around. 48[48, 66, 66] sts. Cont in stockinette st until work measures 22.25 inches from beg. BO 4 sts, k to end. Sleeves will now be worked back and forth in stockinette st.
BO 1 st at beg of next 2 rows. 42[42, 60, 60] sts rem. Next Row [RS]: [K5, k2tog] to end. 36 sts rem. Next Row [RS]: [K1, k2tog, k2tog] to end. 36 sts rem. Next Row [RS]: [K1, k2tog] to end. 24 sts rem. The next step connects the two sleeves and creates the cowl. The rest of the garment will be knit in one piece, so there are no seams! Using circular needle, k across sts of one sleeve, CO 36[38, 40, 42] sts using Cable CO, k across sts of second sleeve, CO 36[38, 40, 42] sts using Cable CO. 120[124, 128, 132] sts. Place marker and join to begin working in the round, being careful not to twist. Work in 2x2 rib until cowl measures 8 inches. Weave in all ends, and fold down cowl to wear! Katherine Summer lives in San Francisco where she works at Imagiknit and teaches knitting classes at the JCC. She also assists local designer Cari Borja. When she isn't knitting she enjoys going to belly-dance classes, sewing, and blogging. She dreams of one day designing costumes for a traveling circus. You will soon be able to see more of her work at katherinesummer.com. Thanks to Beth Whiteside for pattern writing assistance.